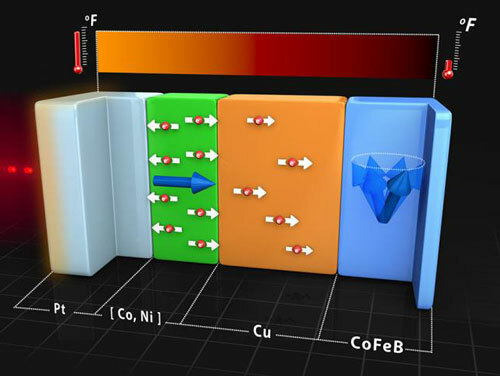 (Nanowerk News) Researchers at the University of Illinois at Urbana-Champaign have uncovered physical mechanisms allowing the manipulation of magnetic information with heat. These new phenomena rely on the transport of thermal energy, in contrast to the conventional application of magnetic fields, providing a new, and highly desirable way to manipulate magnetization at the nanoscale. "In our study, we make use of the fact that a heat current passing through a magnetic material creates a separation of electron spins. This process creates a current of magnetic dipoles that we use to manipulate the orientation of a second magnetic layer," said David Cahill, a Donald B. Willett Professor of Engineering and head of the Department of Materials Science and Engineering at Illinois. "The physics of separating spins with heat currents is related to the operation of thermocouples and the thermoelectric generators that power deep space probes. In those thermoelectric devices, a heat current causes a separation of electrical charges. That separation of electrical charge can then be used to measure a temperature or provide electrical power." "We use the spin current created by ultrafast heat conduction to generate spin transfer torque. Spin transfer torque is the transfer of the spin angular momentum from conduction electrons to the magnetization of a ferromagnet and enables the manipulation of nanomagnets with spin currents rather than magnetic fields," explained Gyung-Min Choi, who recently completed his PhD in materials science and engineering at Illinois. "Spin transfer torque has often been realized by passing electrical currents through magnetic layers. In our paper, we showed how spin transfer torque can be generated by an intense current of heat." "We quantify thermal spin transfer torque in metallic spin valve structures using an intense and ultrafast heat current created by picosecond--one trillionth of a second--pulses of laser light," Cahill added. "This heat current has the impressively large magnitude of 100 GW per square meter and persists for approximately 50 trillionths of a second. The sign and magnitude of the heat-driven spin current can be controlled by the composition of a ferromagnetic layer and thickness of a heat sink layer."